Abbas Hamideh, the Cleveland-based founder of Al-Awda - Right of Return, is prominent in anti-Israel circles. He is one of the main organizers of the anti-AIPAC rallies every year. I have a post from YMikarov detailing his antisemitism. The ADL also has a page with tons of examples of his hate. 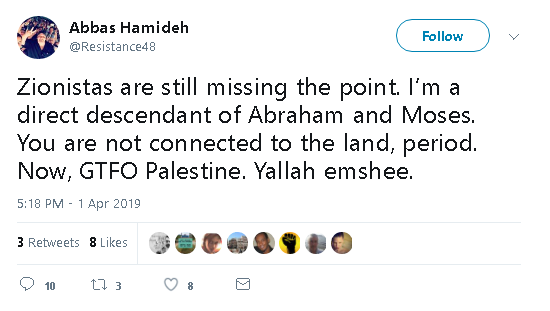 Lately on Twitter Hamideh has been trying to discredit the idea that Jews have anything to do with the Land of Israel. So I decided to look at his family history. Surprise! Any connection his family had with Palestine came after Zionists started to make the land of Israel attractive to neighboring Arabs. The Hamideh family origins are in Saudi Arabia, and when Islam spread to the areas of today's Jordan the clan settled in the area of Moab. It was not a very distinguished tribe. As this 1873 travelogue notes, they were subservient to pretty much every other tribe and they fought among themselves. The transition from the highlands to the mountains is very sudden. Climate and vegetation at once are changed. At first, at the bottoms of the valleys, are many patches of flat ground, covered with the richest herbage. In one of these opens we found a camp of Hamideh, into whose district we had now entered. The first sign of our proximity was a large herd of she-asses and their colts, animals not in favour with the more warlike Beni Sakk'r. The camp consisted of 14 families. Here Zadam halted, and had a long conversation with their sheikh. The manner of both, the nonchalance of the one, the cringing deference of the other, was an amusing illustration of the great man talking with the small one. Zadam, by his contract, was bound to conduct us through the whole of the Beni Hamideh territory, and did not wish to have the expense of their sheikh accompanying us. But the poor man, who certainly had few opportunities of backsheish, urged upon him, "Why should you prevent my going with the Franghi, and getting a little present, when you get a large one?" Our sheikh consented at last, observing to the inferior magnate, that at least there was plenty to eat at our camp; and telling us that the Hamideh came at his own choice, and could not demand a gift. Our new follower devoted himself henceforward most assiduously to me, as a profitable milch cow, doing the civil most oppressively, and kissing my hand on every possible occasion. Honest and inoffensive we found the Hamideh, one and all, but cringing and mean—in fact, with all the characterises of those who have been accustomed to be treated as an inferior race. So far from being independent, as is generally supposed, and has been stated by some writers, there is not a single sept of the Beni Hamideh (or Hamaidi, as some of them prefer to call themselves) which is not the vassal of some greater tribe. All those north of the Arnon, are the "teba'a" (feudal subjects) of the Beni Sakk'r, while those south of it, have the worse misfortune of having two masters; being for the most part vassals of Iverak, and at the same time compelled to purchase the goodwill of their neighbours, the Beni Sakk'r, to whose marauding parties they would otherwise be continually exposed. This position has given them a servile tone and bearing, which is all the more noticeable, in contrast with the haughty bearing of the lordly Beni Sakk'r. Again, there is no unity in the politics of the Hamideh. A number of petty sheikhs, each leading a few families, and loth to acknowledge any superior in their own tribe, are enabled, by the configuration of the country, to hold their several valleys in tolerable security. It is no easy matter to lift cattle across from one wady to another when once they have entered the mountain descents. But it is very easy for the lords of the highlands to sally down any ravine they please, and overrun the valleys. \ This position of the Hamideh partly explains the Idifficulties of most explorers of Moab. They have invariably gone to the wrong tribe; and, learning that the Hamideh possess the sites of the principal ruins, have entrusted themselves to the first petty sheikh of the tribe to whom they could get access. These chieftains were each powerless beyond their own domains; and endless squabbles over paltry backsheish, and final disappointment, have been the result. ...Their own tradition is, that they were driven from the uplands by the Belka Arabs, who in turn have been squeezed out by the Beni Sakk'r. The family, which now falsely styles itself as a tribe of warriors, does have one notable and ignoble place in history. The Mesha Stele, one of the most important archaeological finds of all time, was found in their territory, as a single large inscribed stone. When the tribe got wind that it might be worth money, they dug it out of the ground, set a fire under it, and then threw cold water on it to shatter it so they could send pieces to family members. I'm not sure if this was out of spite or avarice, most of the pieces were purchased or recovered by scholars. Many of the fragments have never been recovered. Now, I don't have specific information of when parts of the Hamideh clan moved across the Jordan, but it isn't too hard to guess that they, like so many other Arabs, were attracted to the Jewish capital and booming economy that Zionism brought to Palestine. And, let's face it, their lives in Transjordan were lousy - they were treated with no respect and instead of building themselves into something they relied on sucking up to the more successful clans. So sometime between 1880 and 1930, some of the Hamidehs came to Palestine and magically became "Palestinian." Notice that while Hamideh's clan did live in Eastern Palestine, in what is now called Jordan, they are not claiming any of their ancestral lands from Jordan. They only want the land the Jews control, which is consistent with all Palestinian Arab demands since 1964. 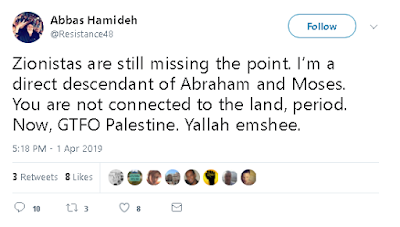 When I called Hamideh on his real family history, he responded with this farcical tweet where he now claims to be descended from - Moses! The Israel haters, of course, aren't put off by little things like lies. 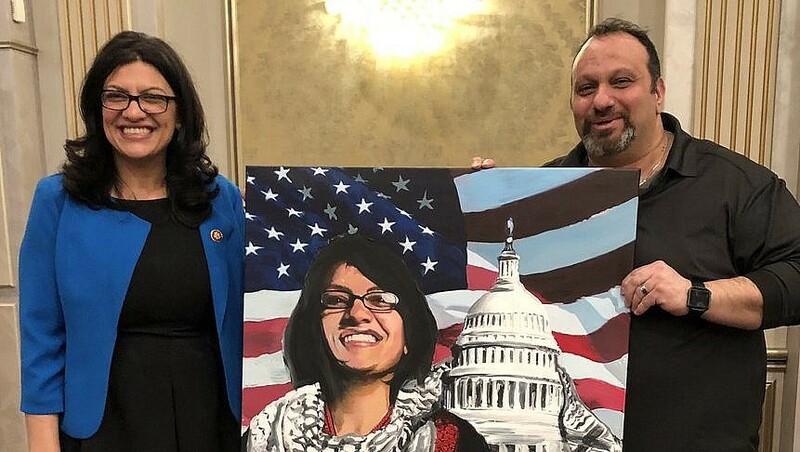 Interestingly, while Hamideh used to be friends with Linda Sarsour and there are photos of the two together, they had some sort of falling out - possibly Sarsour realized that associating with an open Hezbollah supporter was not good for her career. But a member of Congress has no such scruples but to pose with a terror-supporting fake Palestinian from a two-bit Jordanian family.